Join us for the newest monthly kid’s class at Armature Works, Crafts with Ms. Kate! Crafts with Ms. Kate takes place in our Show + Tell space and each month will feature a different craft project for kids to enjoy. February’s class we’ll be crafting valentines, valentines mailboxes to place them in, as well as heart wreaths. Ms. Kate will offer step by step instructions and assistance to help your child create one of a kind crafts to take home with them, all while igniting imaginations and creativity. Ages 3 – 12, parent participation is encouraged but not necessary. 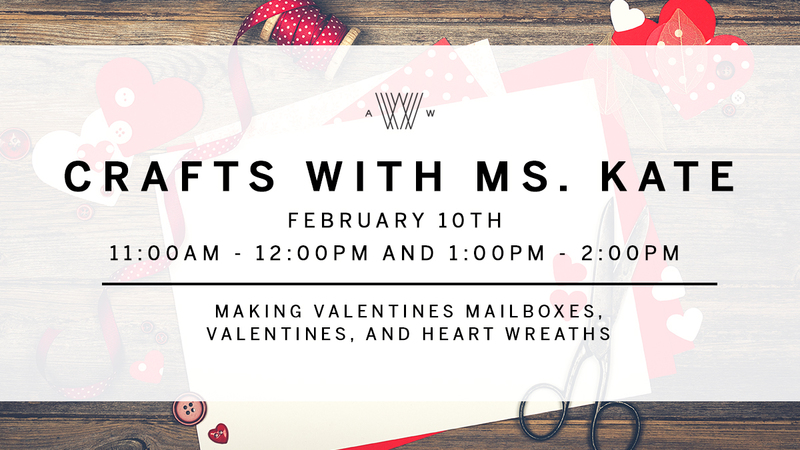 We hope you’ll join us for Crafts with Ms. Kate! RSVP for 11am class here. RSVP for 1pm class here.